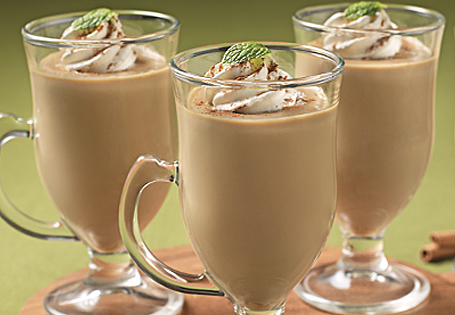 Irish coffee in a classic dessert! In a large saucepan over medium heat, combine milk, instant coffee and Irish Cream. Cook for approximately 10 minutes or until small bubbles appear on bottom of pan when tilted. Remove from heat. In a medium bowl, whisk together sugar, salt, egg yolks, evaporated milk, corn starch, and vanilla. Slowly whisk a small amount of the coffee mixture into the egg mixture, to prevent scrambling the eggs. Continue whisking in order to bring mixture to room temperature. Whisk the egg mixture into the coffee mixture and return to stove. Cook over medium low heat for an additional 10 minutes, or until thickened. Strain mixture into a medium bowl. Fill coffee mugs 3/4 full with pudding and chill for 1 hour. Garnish with 2 tablespoons of whipped topping and sprinkle with cinnamon.